Scott Cassell is an extraordinary individual. An expert military operative, he is also passionate about ocean conservation. 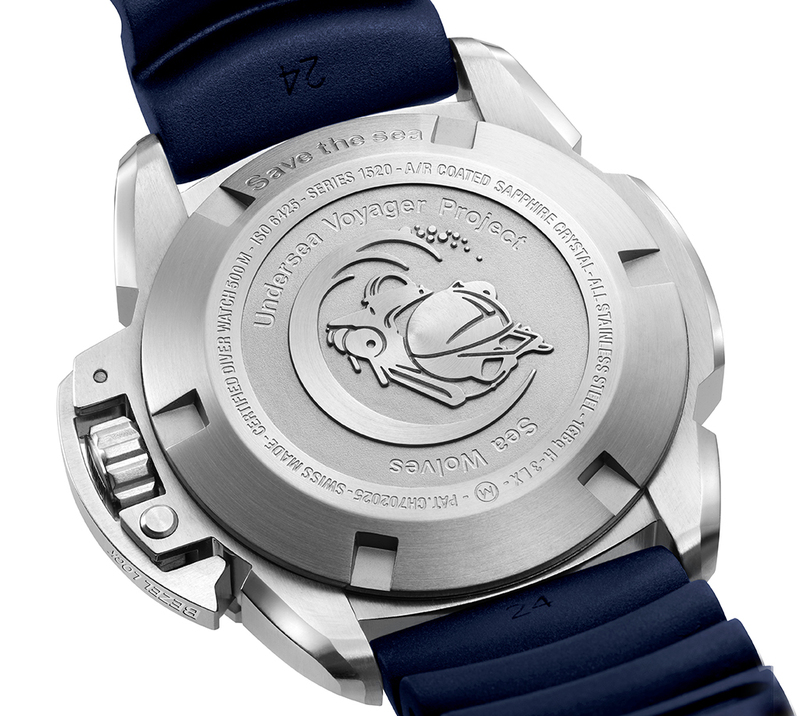 The new watch was created to support Scott’s not-for-profit Sea Wolves Unlimited and UVP (Undersea Voyager Project). Created in collaboration with Scott, a portion of proceeds from the sales of the timepieces support these organizations and help them continue their important work. We bring you almost live commentary from the launch of the new Scott Cassell Deep Dive Automatic in Pattaya, Thailand. Our live coverage can be discovered on our Instagram Live account @deployant from 5PM Bangkok Time November 10, 2017, and will continue until the evening of November 11. As with all Instagram Live and Story posts, the videos and pictures will only be available for viewing for 24 hours after posting. 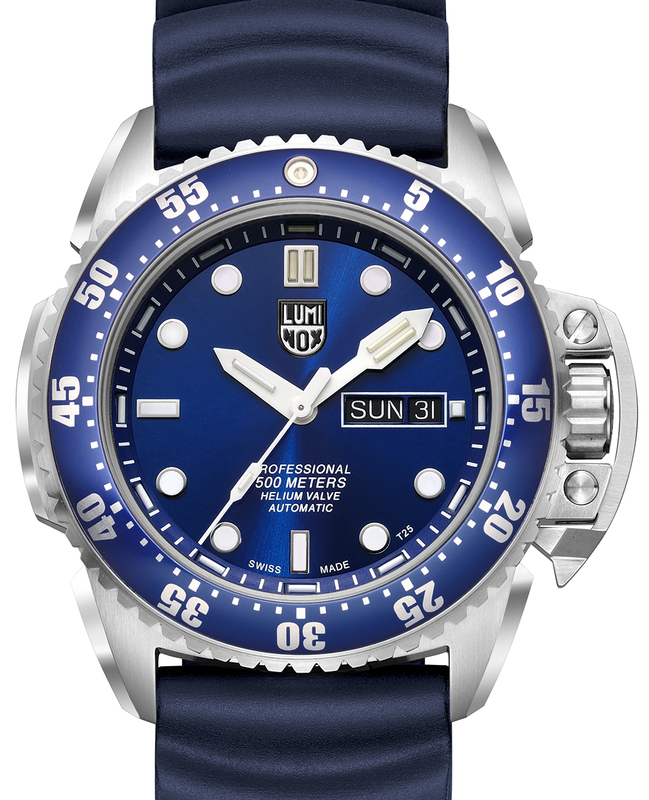 Luminox Scott Cassell Deep Dive Automatic, here with the metallic blue sunray dial and bezel. The Scott Cassell Deep Dive Automatic is a dive watch with features essential rECOn elements, including a sturdy 316L steel case, a professional-grade ratcheting unidirectional dive bezel, patented bezel locking device that doubles as a crown protector, 500-meter water resistance, and a clear, high-contrast dial with the Luminox Light Technology with the addition of Super-LumiNova on the indices, for maximum visibility. Scott Cassell, Counterterrorism Combat Dive Instructor to the Special Ops community, anti-piracy consultant, sniper and former Special Ops combat medic and MedEvac Flight Instructor in the Army National Guard. Photographed in Pattaya, Thailand, November 2017. Scott learned to dive when he was 15 years old and qualified as a scuba diver and underwater welder at that tender age. He would take odd jobs to fund his passion for diving. He later joined the US Army and was selected for the elite National Guards. He considers his watch as essential equipment. He wears a dive computer when diving, but is also equipped with his trusty Luminox for every dive or mission. Two versions are available, one in classic black (model 1521) or blue sunray (model 1523) dial encased in brushed stainless steel or black PVD-plated stainless steel. The matching steel bezels with aluminium inserts have silver Arabic numbers and indices. 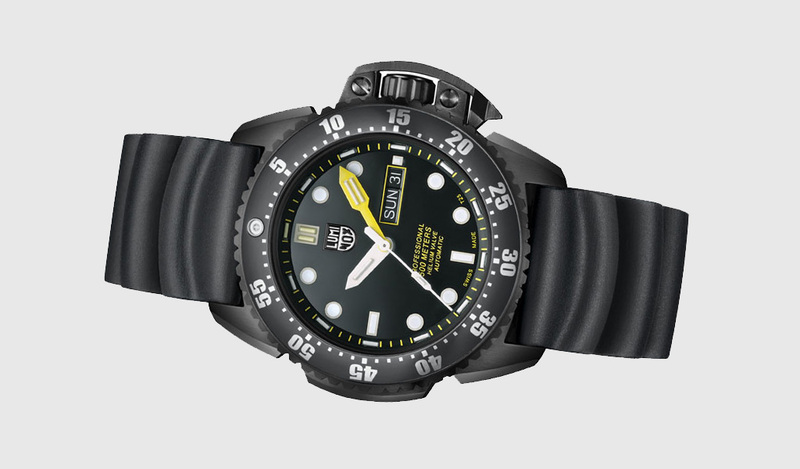 The black version of the Luminox Scott Cassell Deep Dive Automatic. The Deep Dive series are rated at 500m and is equipped with a Helium Escape Valve for professional diving and saturation diving conditions complying with ISO 6425. To meet these requirements, Luminox made the sapphire crystal to be 3mm thick (twice thicker than a watch rated to 200m). The case-back is also 3mm piece of stainless steel. Steel deforms at 50 bar pressure, so the overall case construction has to be much more robust and rugged. The case is in a massive 316L stainless steel and is a hefty feel on the wrist. The case is a massive steel case, with a crown guard which also acts as a locking mechanism for the uni-directional ratcheting bezel. A uni-directional ratcheted bezel is fitted. The entire bezel can be locked with the patented Bezel Locking System (BLS) which is a lever hinged at the top of the massive crown. When pushed securely in, it locks the bezel, making it immovable in either direction. When released, the bezel operates like most dive bezels, allowing it to click anti-clockwise and not clockwise. Divers want to stay down as long as they safely can, and need as much time as they can get for deep diving. 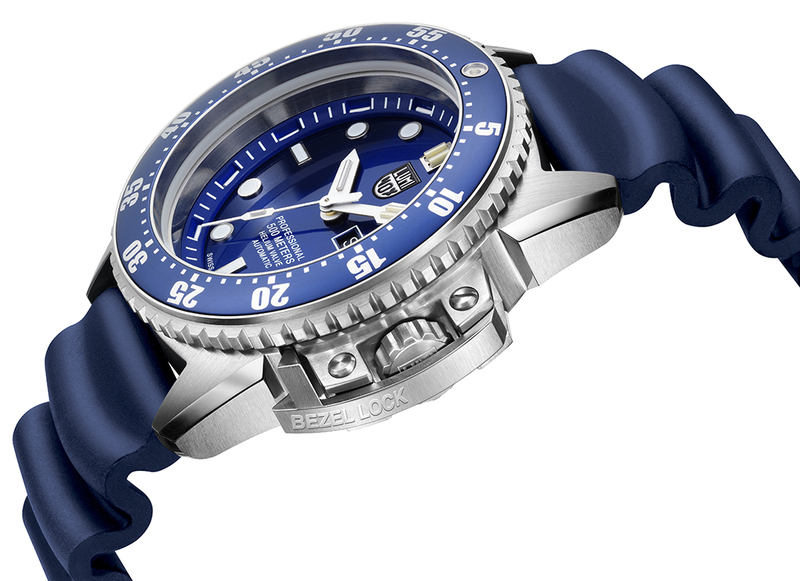 This newly invented Bezel Locking System ensures that the time the divers set with their turning bezel will stay set, by simply locking the crown protector into position. 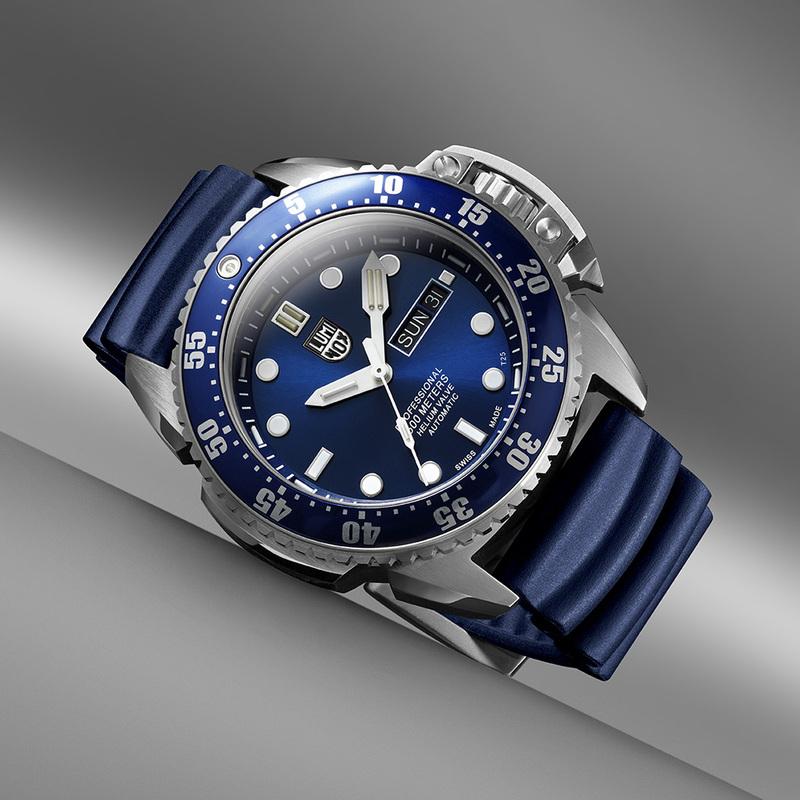 The dial is a beautiful metallic blue with a sunburst pattern which plays beautifully with light at different angles. The hands are dagger shaped and fitted with what Luminox calls their Light Technology, which uses tubes made by mb-microtec AG. 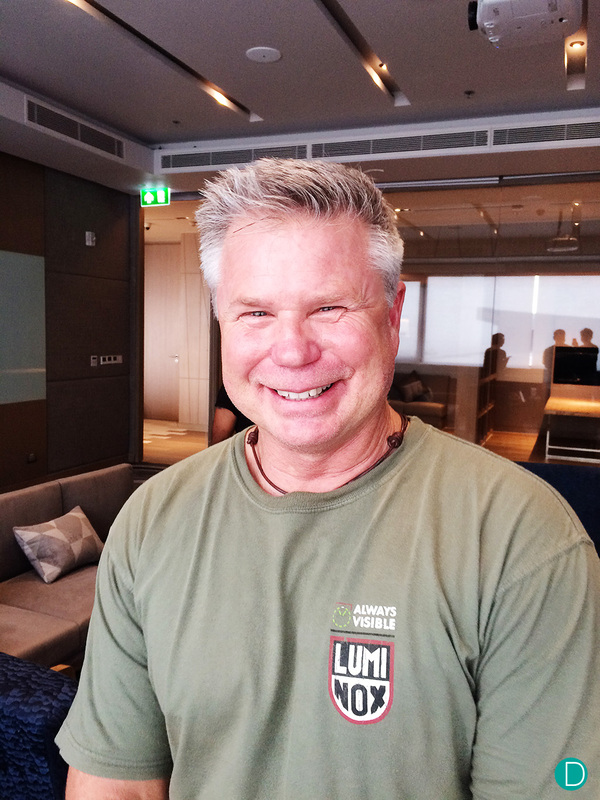 Our interview with the then CEO of Luminox Barry Cohen tells the story behind this amazing technology. These Light Technology tubes are used on the minute hand (two tubes), the hour hand (one tube), and as strips on the outer edge of the hour markers. The hour markers themselves are infilled with SuperLuminova, and the dual glowing system complements each other well. 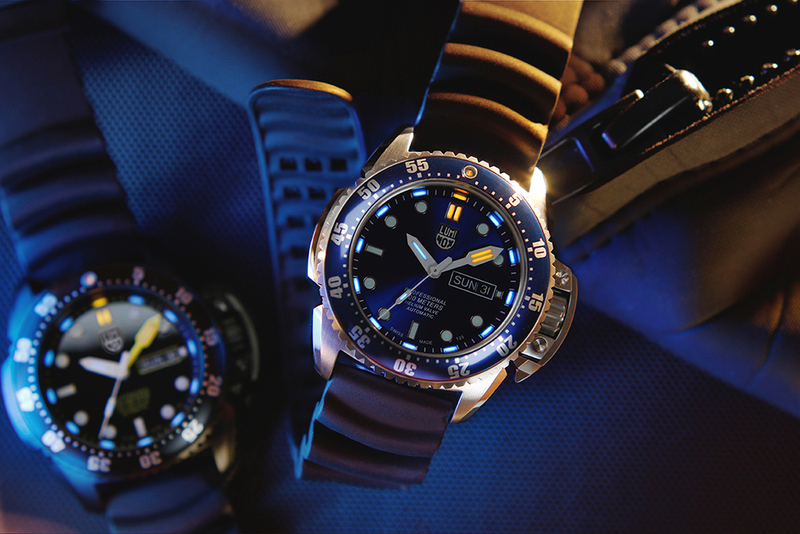 The lume is bright, and part of Luminox’s tagline of “Always Visible” philosophy. On the wrist, the watch feels comfortable, as can be seen on the watch roll video below, strapped to my 7″ wrists. A removable rubber strap with a special backing to reduce sweat is fitted. A loop stopper and stainless steel buckle are standard, as is a wetsuit extension strap which is a short strap attached to the end of the regular strap to allow it to go over the wetsuit. Case back with Scott Cassell’s motif. The case back depicts Scott Cassell’s ‘Great White’ submarine. Each watch is individually numbered and comes in a specially-designed, water-resistant gift box which can be used to store the diver’s mobile phone, camera or other personal gear. The movement is the Selita sw220-1 automatic movement which is a workhorse movement capable of the task. Price: TBC, but circa S$2,800. ISO 6425 testing of a diver’s watch consists of the following tests and no evidence of water intrusion or condensation is allowed. The resistance of crowns and other setting devices to an external force. Water-tightness and resistance at a water overpressure. Besides water resistance standards to a minimum of 100 meters (330 ft) depth rating, ISO 6425 also provides minimum requirements for mechanical diver’s watches. The presence of a time-preselecting device such as a unidirectional ratcheting bezel protected against inadvertent rotation or manipulation. The time must be legible at a distance of 25cm with the minute hand easily distinguishable from the hour hand. A running second hand with a luminous tip to indicate that the watch is running in total darkness. Magnetic resistance; shock resistance; resistance to salty water; the resistance of attachments to external forces (strap solidity).